As a child I wanted to fly Spitfires. Not Hurricanes. Not Blenheims, Fireflys, Swordfish, Typhoons, Tempests, Wellingtons or Lancasters. And definitely not Defiants. Only a Spitfire would do. Even though I was born in the late 70s, all of my class knew what a Spitfire was. Modern RAF fighters like Jaguars or Tornados meant nothing to us, but somehow the Spitfire endured, swooping through the years to claim the imagination of yet another generation of London school boys. And as we lay on grassy banks, gazing up into a mid 80s summer, it was easy to transform wisps of cloud and vapour trails into Battle of Britain skies. There duelling Spitfires and Messerschmitts wheeled and dived, locked in endless combat as we dreamt of roaring through the heavens in history’s most magnificent flying machine. Yet we were only the latest in a long line of aspiring Spitfire pilots. Our shorts-wearing predecessors of 1940 are the most celebrated, but there have been many others. One of the earliest, and certainly one of the bravest, was a real ace. Adolf Galland was a Luftwaffe Major and flew an ‘Emil’, as the ME 109-E was known, in the Battle of Britain. The Emil was a fine aircraft, more of a clunking fist than the nimble Spit perhaps, but still one of the most feared fighters of its day. So Galland’s response to Goring’s question at a meeting in 1940 about what his commanders needed to win the Battle of Britain is all the more remarkable. ‘A squadron of Spitfires’, was the Major’s devastating assessment. The rotund Reichsmarshal was left speechless with rage. Of course Galland never got his squadron, but while Luftwaffe pilots could no more fly Spitfires than English school boys, they felt no dishonour in being shot down by one. At least one Hurricane pilot recorded his disgust that his opponent refused to admit that he’d been downed by anything other than a Spitfire. This snobbery was encouraged by British propaganda, which cynically reassigned Hurricane victories to bolster the reputation of the invincible Spit. They did their job well. Generations of war comic book aficionados are still familiar with the spectacle of wide-eyed Wehrmacht soldiers fleeing in disarray, screaming ‘Achtung Spitfeuer!’ But it could all have been so very different. 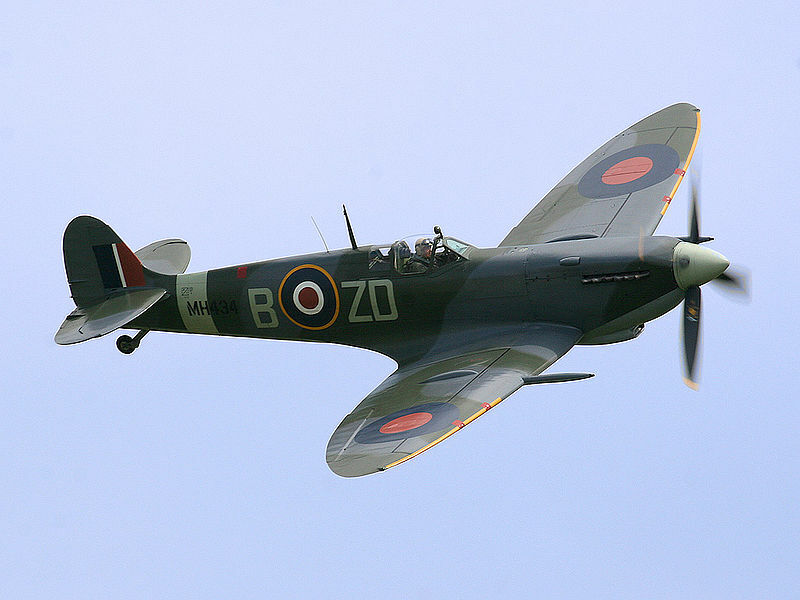 The aircraft known as the Spitfire was the brainchild of Reginald Mitchell. But its name was not. Vickers, the overall manufacturing company, was eager for a name that was feisty and venomous. They were the ones who suggested dubbing the new fighter a ‘Spitfire’, but this did not play well with Mitchell who regarded it as ‘Just the sort of damned silly name they would choose’. He preferred the name given to an earlier prototype: ‘the Shrew’. A squadron of Shrews? Never mind that ‘Achtung Spitzmaus’ doesn’t have quite the same urgency, or that this would leave the Hurricane with the most macho name in the Battle of Britain, could I really have held my head up high as a 1980s schoolboy and said ‘Yeah, I wanna fly a shrew?’ Could anyone? Thank heavens for the renaming of the Shrew. While Mitchell might not have been sound on the marketing, his design was a triumph. You hear plenty about elliptical wings and graceful curves when Spitfires are discussed, and the aesthetics certainly bewitched my childhood self. But the aircraft was not just beautiful, it was revolutionary. Such was the assurance with which Mitchell blended cutting edge designs that the Spitfire earned the distinction of being the only fighter in production at both the beginning and end of the most innovative war in history, and arguably the most innovative period in human history. But keeping up with technology had its costs. The iconic wings and tail were clipped, while the cockpit canopy was redesigned. Affectionately referred to as ‘topped and tailed Spitys’, those late models were no lookers. I wanted to fly a Spitfire, but I didn’t want to fly one of those. It was unwise for a wanna-be 1980s flyboy to be so picky. Growing up is about indulging your childhood dreams, but that Spitfire flight always eluded me. And that’s a fate many schoolboys have had to adjust to. After all, the very last Spitfire rolled off the production line in 1948, so it was only the oldest kids gazing in awe at those 1940 September skies that had a chance to emulate their heroes. But I must have got closer than most when I clambered into the cockpit of a museum Spitfire. Looking out through the cloudy bulletproof glass the engine seemed to stretch on forever, while the fuselage closed in tight, leaving very little room to manoeuvre the legendary control column. And in that moment of claustrophobia I realised that the Spitfire’s beauty was only aluminium deep. Here, on the inside, its purpose was laid bare. Trailing wires, greased metal and a reflector gun sight – this was no Rolls Royce of the air, it was a war machine. An aerial gun platform designed to vie for supremacy, exchanging murderous bursts of fire in chaotic and deadly dogfights. That brought other aspects of the Spitfire’s design home: the difficulty in getting out in a hurry, and the huge, combustible fuel tank in front of me that could raise cockpit temperature to over 800°C in seconds. Suddenly I felt incredibly lucky that I was born too late to answer the beguiling call of this siren of the skies. Great article! Amusing remark about ‘…this was no Rolls Royce of the air.’ My late father-in-law was an engineer at Wilmot-Breeden, the ‘shadow factory’ in Castle Bromwich that made engines for Rolls Royce – and the Merlin engines for Spitfires.